This sweet baby grey and white pitty almost drowned to death in New Jersey at the end of July. Thank goodness Jenniffer Vaz was out walking her own dog Molly and Molly spotted him in the cage, which was slowly filling up with water. Jenniffer and Molly saved River and they're going to be his family now. Sign the petition to demand justice for River! 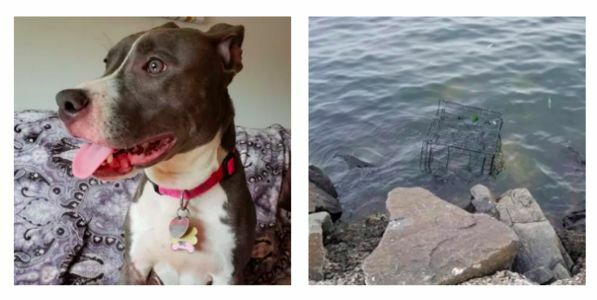 Someone put this 1-year-old pit bull mix into a steel cage and dropped him into this river, where they knew he would ultimately die slowly and painfully. The vet who examined him after he was rescued says he seemed to have been well cared for - at least physically - before this incident. So why did some monster decide he should die in this horrific way? River is a sweet dog, and he and Molly, his rescuer dog, get along really well! It's unthinkable that someone not only didn't want him, but thought he deserved to die alone and scared. Please sign my petition to demand local authorities do everything they can to find the person responsible!